Black Veil Brides frontman Andy Black has taken to instagram to announce that his second solo album is underway. Posting a series of photos from the studio alongside producer extraodinarie John Feldmann, Andy said that he is currently "working on AB 2." He continued his instagram post by sharing how excited he is for fans to hear his new music, stating "I am so thrilled with this record and can’t wait for you guys to hear it! A lot more to come soon!" This album is set to be the follow up to Andy's 2016 debut solo album 'The Shadow Side' which saw him head out on Warped Tour sans-Black Veil Brides for the first time last year. And that's not all- it was announced last month that Black Veil Brides are heading back in to the studo to re-record and re-release their debut album 'We Stitch These Wounds'. 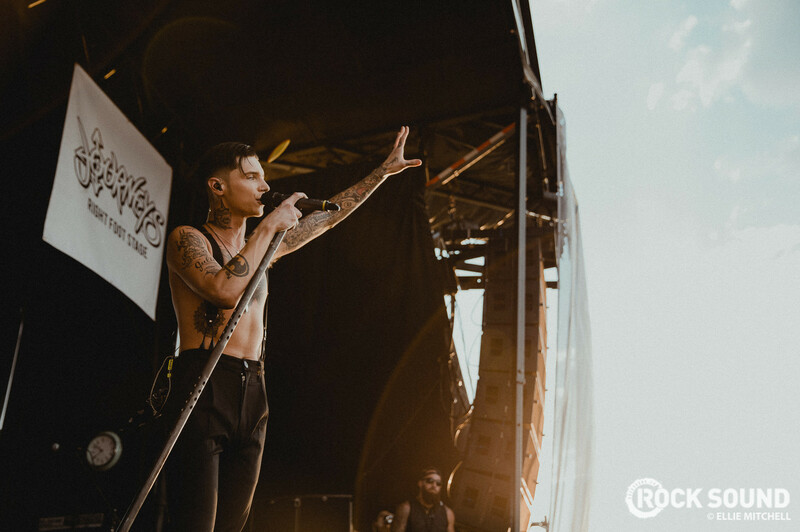 IT FEELS LIKE TODAY HAS BEEN A REMINDER OF HOW MUCH BLACK VEIL BRIDES MEANS TO SO MANY PEOPLE. "I think what anything like this can remind you is – and I don’t mean to sound grim – but bands are collections of people that innately have differences of opinion in day to day life. When you go to lunch with your friends, you don’t notice if they order something different than you or think of it as a weird thing. The truth is that every single person from any walk of life feels differently about something than the person next to them. Not everyone agrees 100 per cent on everything all the time. And the problem with the perception that’s built with bands is because they’re a united front musically, there’s an assumption that everything is a group thought, that every single thing is agreed upon by every single person and initially, that isn’t always the case. Ultimately the things that you see by and large that are released by bands are things that were discussed and agreed upon and initially there was some disagreement and eventually it was agreed that it was the best thing to represent the band that you’ve created together. It’s a rare situation that you see someone strike out in a band and say something that is going against maybe what you perceive the band’s collective notion to be, so I think what it points to is the fragility of a group of people together if you are unable to accept that other people might have different opinions and I think maybe for the audience it can show that a band doesn’t need to be a bunch of people agreeing about everything all the time, they may feel differently about things but that doesn’t mean that the band is in a dire situation or everything’s going to end, it just means that sometimes people don’t agree, and that’s okay." IT’S SHOCKED A LOT OF PEOPLE BECAUSE THOSE DISAGREEMENTS RARELY HAPPEN SO PUBLICLY. "I’ll say this, I’ve been in a situation since I was a teenager where people in our world, particularly on the internet initially, have taken me and lifted me up to this level where I now get to do this professionally and I get to talk to people like you and I get to pack a suitcase and go on the tour that I grew up dreaming of being on. Those people are the people that as I said earlier, this affects the most. And to those people, I would simply say that my intention is to continue to do the things that I have been given the form to do forever and I think that I can safely say that the rest of the band feels the same way. Now, what that means moving forward in terms of how we perceive their place in this artistic world or what kind of music they make or where they’re making it or whatever else, that remains to be seen. But as of right now, there is nothing but agreement from everyone involved that we are moving forward as a band and it is not the intention to break up, certainly not after these eight Warped Tour shows." SO NO BREAKUP, BUT EVEN A HIATUS HADN’T BEEN DISCUSSED? JUST DOING THIS RETROSPECTIVE RELEASE AND CARRYING ON? "Here’s the truth. On a personal level, I developed the Andy Black project several years ago and I signed a record contract and I made a record and then went on tour. And then, because I have a record contract, it came time to do another one. They said, ‘Hey, we’re going to need another one of those now’. And I am more than happy to do that and I think it’s a real cool opportunity to do that, but there was always an intention to start this record during the time that we were in our downtime. I have about eight songs done, I have to finish it and I contractually have a date by which I have to release it. Similarly, Jake [Pitts], the guitar player in Black Veil Brides who is just as much an equal member as me, formed a band with his wife [Aelonia] and has been working on that for several years. Now, because of the time frame in which we were allowed to release anything away from the label that we were previously with, he’s going to be able to release the full-length record that he’s been working on for some time. There are things that happen in the context of your career if you’re lucky enough to have people that pay attention to what you’re doing that may afford you the opportunity to make different types of music and to do different things. I think it’s encouraged for every member of this band. To me, we all do our own things and the understanding is that at the end of the day, we come back together and this is our home, so to speak. So there was never talk of a hiatus. Record cycles end and then new ones start, the plan for us now is to move forward working on the retrospective release which is a pretty involved process, one that Jake is producing and that we’re really excited about." Read our full interview with Andy here.